Check out the red mite or tick on the side of the fly! 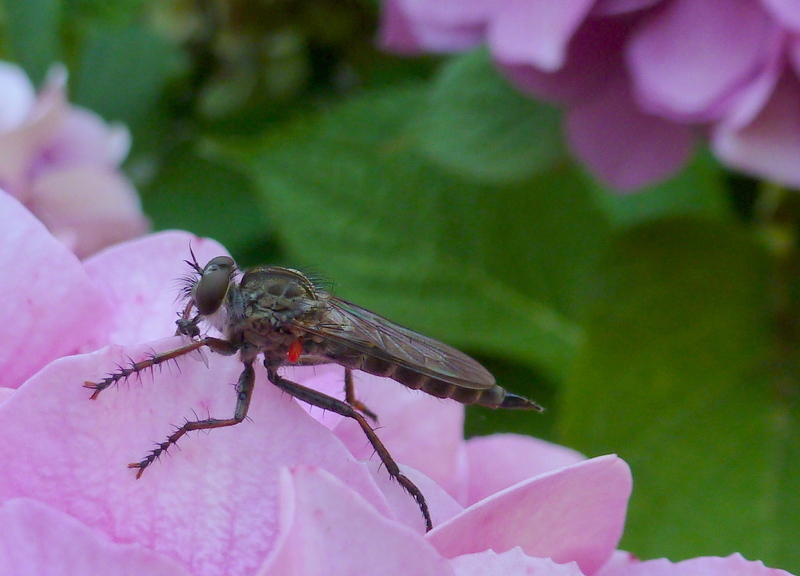 I was taken aback when I saw this robber fly on my hydrangea about to tuck into a smaller fly while he himself was being made a meal of by a red tick or mite on his side. So what’s inside the mite – bacteria, ‘phages, viruses, prions? Mmm, first poetry, next philosophy, I think I prefer to keep to observation. Categories: insects | Tags: garden, gardening, insects, life, nature, photographs | Permalink. Thank you. I am hoping to get a SLR soon to improve the quality of the photos. This insect is a robber fly. The family Asilidae. Thank you for the identification, I was not inferring that it was a flea in the literal sense more that it was an insect (like the flea) that is not held in high regard by humans. Are you an insect enthousiast?